Never confuse Christ’s ‘Great Commission’ to Peter to preach, with God’s comission to St Paul… they are two separate commissions with two separate gospels. 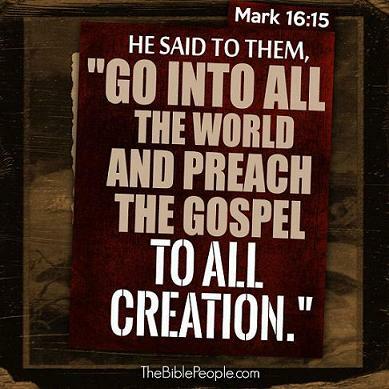 This was actually Christ’s commission to Peter and the eleven in respect to the Kingdom gospel…. which never got past stage 1…. Jerusalem, because the great % of the Jews Rejected Peters preaching of Christ as King, just as they had rejected Christ’s own ministry. Peters commission ended in Failure at the Stoning of Stephen, and Christ was Sanding on the Right hand of the Father ready to return and crush those whom rejected the message… exactly as was warned in all the preaching of the Early book of Acts. Yet instead Of the second coming… Something very different and unexpected happened. God showed Absolute Grace towards Saul and appeared unto him, and forgave him, and made him an apostle with a completely new Gospel, and sent him to preach it to the Gentiles…. while the Jews were now set aside for terrible judgement. And this is when *our Gospel* was first preached on the Earth… God gave St Paul a new Revelation That The Cross was not simply murder… as Peter had preached on the day of Penticost… but actually a secret plan of God to atone for the sins of all humanity, and that whosoever believes in this…. will be saved…. without works… without the Law. When you go back and look at when Christ talked about being killed… the bible clearly teaches that the disciples didn’t understand this as it did’nt fit in with their understanding that Christ would redeem Israel from Roman oppression and Rule as King. The Bible clearly teaches that the Real reason for the Cross was hidden from them. They did not even understand the resurrection. …For Christ sent me not to Baptize…. 1 Cor 1 17. Peter was sent with signs and wonders… because the Jews require a sign, Yet St Paul said that Signs and wonders would cease… because after a remnant of the Jews accepted Paul’s Gospel. God was no longer going to give them special treatment… and they would have to simply believe the Gospel when offered to them …. just the same as the gentiles. The Jews had a special place under The Kingdom Gospel of Peter “Unto your Fathers were the Promises Given”, yet this Nationalistic Gospel was set aside and the Kingdom postponed due the the rejection of Christ Twice offered…. once before the Cross, and again after by St Peter. Under St Paul’s New Gosple… it had nothing to do with establishing a National Kingdom, but the focus was upon *Individual Salvation* from Divine Judgement for their sins. This New Fellowship was not a Reformed Judaism… but a completely new thing…. the fellowship of the Mystery. to enter Chrit’s kingdom a person had to keep the Law and ‘endure unto the End’, whereas under St Pauls gospel of grace, a person is 100% saved simply by belief alone…. without works…. without the Law, and no condition of having to ‘endure unto the end’. These and many other things distinguish the vast differences between what St Paul Preached from what Jesus and Peter Preached. 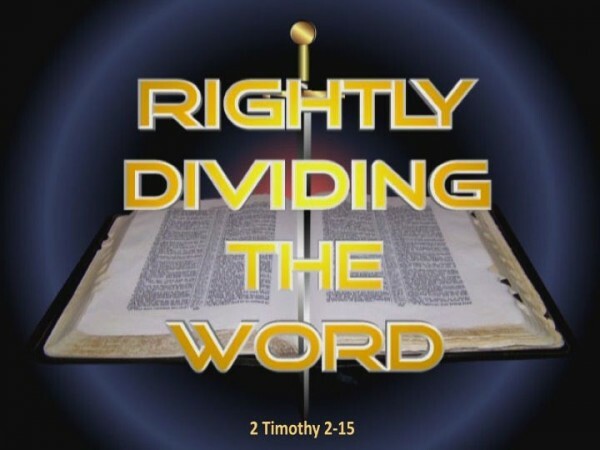 Once a persons eyes have been opened to these important distinctions they will wonder how they ever missed them for years and years of reading the Bible…. it is because Satan has succeeded in hiding the True Gospel and the so-called Orthodox churches have been corrupted and now walk in utter darkness. 1611 King James Bible believer, Protestant, Dispensationalist, Libertarian. Read More…. The Irony. Why I follow St Paul… Not Jesus. Previous PostEternal Vigilance.Next PostRediscovering Dispensational Truth…Exposing the Frauds of Orthodoxy one Fallacy at a time… Part 1. Christ’s Gospel. I mean this in the nicest possible way, but this is serious heresy. Your allegation is that Jesus, then the Holy Spirit, failed in their mission. What happened to Christ building His Church, which the gates of hell will not prevail against? You are essentially saying that Christ cannot save – that His gospel was inadequate, and that only Paul’s gospel, which you allege is different, is adequate. This is MANIFESTLY not so! It is Christ who is the incarnate God, the Logos, the fulfilment of the Holy Scriptures, not the negation of them, and it is His incarnation, ministry, death and resurrection that tramples down death by death and bestows life upon those in the tomb. If you think Jesus is wrong and “Paul is right”, woe to you! To deny that Christ’s acts are salvific is to deny His divinity, which is the old heresy of Arius. And besides which, your ultra-Protestant view of what Paul supposedly thinks about grace and redemption is a pale shadow of the fullness of our true inheritance in Christ. It offers no real salvation in this life, nor does it give any promise of transfiguration or union with the Divine Energies of God. In short, your “gospel” is not particularly good news at all. It’s pretty lame. And there are two many passages in Paul’s epistles that completely contradict what you allege he proposes. I will say this, however. Your attempt to put forward multiple dispensations is at least a recognition of the flaws in the doctrine of dispensationalism. But the solution is not to create more dispensations, it is to reject the idea of dispensations at all. There is one God, one Path to salvation, one Way, one Truth, one Life. God is not a man that He should change, and the Old Testament’s SOLE PURPOSE is not to show a history of God “trying different stuff”, but to reveal Christ. Christ is the meaning of the Law and the Scriptures – all of them! A misreading of Paul’s epistles to fit your theory is not salvific, because you have, with your own words, rejected Christ. Hell just froze over. Blair and I agree on something. The story of the Noahic flood shows God changing his mind and “trying different stuff”. The OSB LXX uses the word “grieved”, not “regretted”, which does not suggest any change of mind. (I’m sure Tim would agree that the NIV is often lacking!) God is always Holy, and cannot abide evil. You also missed the next verse: “But Noah found grace in the presence of the Lord God.” The story of the Ark and the human race is the story of our own salvation in Christ, which also commences with the deluge of Baptism. God’s plan has always been the same – to commune with His creation, to save those who respond to His Acts of Love, and to purge creation of those who choose not to participate in that communion. Noah’s story is Abraham’s story is Moses’ story is Paul’s story. That story is Christ – the Way God restores communion. The KJV is clear enough. Maybe the Masoretic and LXX are different. Or maybe they aren’t, and English just conveys the concepts badly. Personally I believe “grieved” is the most theologically accurate, and reflects the traditional teachings of the Church best. What have your personal preferences among Bible translations and the traditional teachings of your church got to do with so-called theological accuracy? Nothing. Whereas, Tim’s dispensationalism has explanatory virtue, at least. What have your personal preferences among Bible translations and the traditional teachings of your church got to do with so-called theological accuracy? Everything, since the Church wrote the Scriptures, and the Church testifies to the true nature of God – the very definition of “theological accuracy”. The Church testifies through Scripture that God is unchanging, and therefore “grieved” is clearly a more consistent rendering of God’s divine disposition towards His wayward creation. I agree with Blair, except this is not even worthy of being called heresy, it’s just nonsense. What problem were you trying to solve when this idea came into your head as the answer for it? Abandon all reason, ye who enter here. The ridiculousness in this portion of the denial of Dispensational truth that it denies God himself can make judgements! Ie One moment God is pouring out blessings, the next Curses… Of course God hasn’t changed… only his dealings with humanity change dependent upon *man’s* ‘success’ or failure to keep his side of the covenants…. ‘deals’ which which he has with God. Eg Adam enjoyed full fellowship with God *until* he broke the covenant God set for him… *then* His relationship changed and he came under the Curse of Death. *This is one very simple and yet profoundly important Dispensational truth*. We say that there was *an age of innocence* in which Man was sinless and there was no Death. *after the Fall* Man became a sinful and mortal Being. *God has not Changed* Yet his relationship and dealings with Man Change Immensely. And to address Blairs accusation that Dispensationalism infers ‘God failed’ to set up his Kingdom which Christ offered is again *Ridiculous* because God Sent Christ *as Promised*… Thus Christ’s ministry was a testimony to the truthfulness and reliability of God’s word and promises, and *It was Israel that Failed*…. not God! Israel failed to recognise *the time of their visitation* Luke 9vs 44. Thus the failure for the Kingdom to come was another *human failure*…. just as was the Fall of Adam…. in none of these things did God change in his nature, or fail…. he merely *Judged*… in complete accord with his covenants. And the Deeper meaning is this: Christ first appeared and offered humanity his Government in Meekness, and on a voluntary Basis…. yet Israel chose to reject their messiah being blinded by the Traditions/ orthodoxy of Men. Yet We know that he will one day Return In power and glory… and *Then* establish his Kingdom in Israel… *By force*. God foreknew that when he sent Christ that Satan would conspire with the corrupt jewish priesthood to murder Christ… Yet The secret that this was itself part of God’s plan was not reveiled until well after the fact…. even though there were prophecies about it…. these prophecies were not understood… not even by Satan… and that is why He played his part in crucifixion. He did not know that he was actually participating in the secret mission of Christ to attone for sins of Humanity. Thus God chose to Hide these truths until *After* that fact! *These are all Dispensational truths! Tim, that’s a much better explanation. Still not sure I agree with you, but I think you’ve used much better language here to describe things. I think even the term “dispensation” is problematic, when others will talk about covenants (old and new), and what those mean. So, God doesn’t merely change his mind, he goes back on his word? No good at all, Blair. To base an entire argument on the difference(s) between your preferred translation of the Bible and others is plain and simple question-begging. Tim’s argument for dispensationalism is an inference to the best explanation. How can we best explain the seeming contradictions (say, between what the Apostle Paul taught and what Jesus taught)? As an inference to the best explanation, Tim’s argument has merit. Whereas, your argument from authority (OSB LXX) proclaims its fallaciousness on the housetops. I thought it was obvious that I WASN’T basing my argument on a translation of the Bible, but on the testimony of the Church. Everything in Christianity stems from the testimony of the Church. The Bible is just a set of books the Church wrote to testify to what it saw, heard, touched, smelled and tasted. A God that changes His mind is not what the Church saw or heard. So if you think the Bible says that, then either you are wrong about what the Bible says, or it is imperfectly translated or written. The real question is: “Is the Church right when it says that God does not change, or make mistakes that He “repents” of?” The Bible can help us answer that question, but it may not provide the complete answer, since that was never its intended purpose. The only way we can really answer the question is to come back to the testimony of the Church in all its fullness and judge for ourselves whether it makes sense to say that God “repents” of things in that light. My view is no, because it makes everything else in that testimony nonsensical if it is true. You end up believing in a God akin to the Mormon God – someone who is “just another guy”.